Through the effort of Mr. Fernandez Anderson, the University has acquired twelve (12) interactive whiteboards, which so far is installed in the Faculty of the Built Environment, the Faculty of Science & Sport and the Western Campus. Mr. Anderson has been sensitizing staff in these areas on how to use the technology. The invitation was extended to other members of the University and the forum was held on October 18th. It is our hope that more staff members will integrate this technology into their teaching and learning process. Please leave a comment below on the creative ways that you think this instructional technology can be used to enhance teaching and learning at UTech, Jamaica. The Office of Distance Learning continues to offer Basic and Intermediate Training Online. Both online training sessions are Tutor-facilitated, self-paced and competency-based. After the successful completion of each unit you will be awarded a Badge and upon successful completion of the entire course you will receive a Certificate. We advise that the Basic Training Online is done first if there has been no formal training or introduction to Moodle prior. The Basic Training is designed to equip participants with the knowledge and tools needed to facilitate the creation of an online module in Moodle. The Intermediate Training aims at providing participants with the requisite training to use the advanced features of Moodle to customize and populate an online course shell. There are various activities within Moodle that can be integrated into a course that allows for student interaction and engagement. The Office of Distance Learning is currently working on redesigning the way in which the Basic and Intermediate Training online are being offered. The aim is essentially to better captivate the attention and interest of the persons taking the online training through the use of a more interactive platform to be integrated in Moodle. The name of this platform is Articulate Storyline which is compatible with Moodle. Articulate Storyline is an e-learning authoring software which helps to simplify every aspect of course authoring and e-learning development. 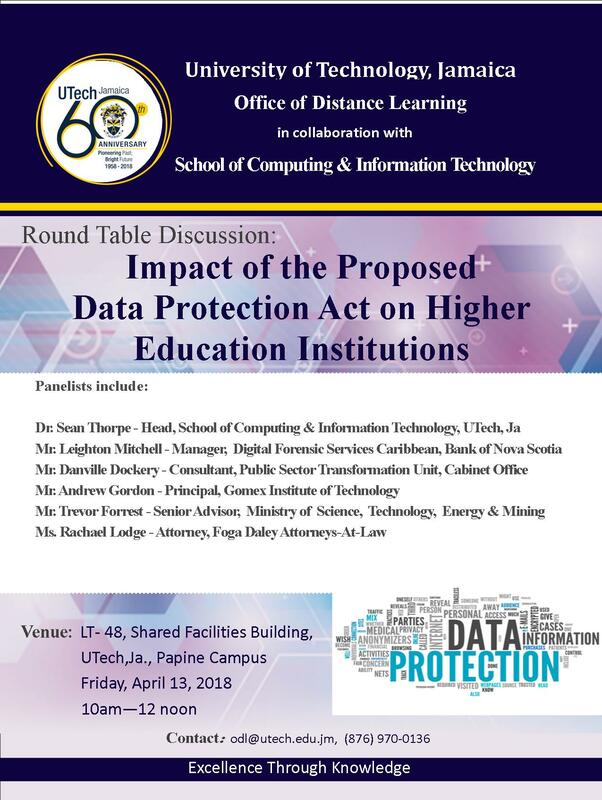 What are your thoughts on the Impact of the proposed Data Protection Act on Higher Education Institutions in Jamaica? Kindly leave your input below. In designing an online course, one has to be mindful of several factors. The online student is not in contact with the lecturer in a physical way. With this concept, the thinkers in the field no longer embrace lecturer to describe the role being played by the person offering the course because the technology is now the medium through which the content is presented. So the facilitator, once called lecturer, has to ensure that the student learns what is needed through their guidance and use of technology. The design of the online course has to be closely aligned with the learning principles and practices in the field of education. Such a design should cause meaningful learning to happen and enhance student engagement and knowledge building. It is true that online course design comes with great challenges, but all can be overcome through proper planning and employment of online learning tools. Online learning does not seek to replicate face-to-face lectures, which in themselves can be grossly inadequate to meet the unique needs of each learner. Some aspects of the classroom delivery will never happen in online delivery. For example, student will not be subjected to didactic teaching and lengthy lectures. Online learning is flexible, interactive, engaging, gives opportunity for problem-solving and knowledge building. However, it is expected that online students be given equivalent learning activities, assessments and opportunities to interact with the content, as their colleagues in face-to-face setting. In light of the unique learning experiences in the online environment, what would you suggest as best practice for handling online assessments? Should online students be given more graded assessment pieces than their on campus counterparts? How many forums should be placed on a course? What method would help to determine a number that could be used as benchmark? Explain your rationale. Accessibility means that persons with upper body impairments, blind and those with visual impairments, with visual or cognitive /learning disabilities and hearing impairments can have ease of access to online course content (Coombs, 2010). Accessibility is important so that all users have equal opportunity to interact with whatever is being offered. The designer, in making a website accessible, must make an effort to capture all opportunities that exist to reach those with disabilities. A Learning Management System (LMS) should be easily accessible to learners, with or without disability, and empower the learners with all that is needed to successfully complete the course. The Disability Act 2005, defines Universal Design, or UD, as the design and composition of an environment so that it may be accessed, understood and used to the greatest possible extent, in the most independent and natural manner possible, in the widest possible range of situations, without the need for adaptation, modification, assistive devices or specialized solutions, by any persons of any age or size or having any particular physical, sensory, mental health or intellectual ability or disability (National Disability Centre, 2015). Our online courses or modules should therefore be accessible to students who have auditory, visual, cognitive, and/or physical disabilities (Blackboard, 2017), so that they can fully participate in every aspect of the offering. Learners who enroll in any of our modules, whether fully-online, blended or web-assisted, need a rich and fulsome experience that is more than just being technology-mediated. UTechOnline aims to give each user a great learning experience that is focused on their achievement of their educational goals. As we begin to explore how best to satisfy learners with diverse characteristics, here are some guidelines to follow to ensure that modules reflect Accessibility Principles or Universal Design (UD) for online. 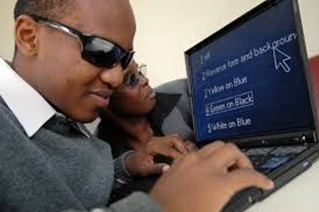 Individuals with severe visual impairment may rely on a screen reader to access Web sites. Use visual cues, such as images, section divisions or table headers with descriptions. Low vision users need a mechanism to zoom in on content on a computer screen, sometimes to a great extent. Zooming works well for vector-based text and graphics in PNG format. These users need to be provided with amplified sound or alternate ways to access information through vision and/or vibration. Aids would include hearing technology, alerting devices and communication software supports. Content that flashes at certain rates or patterns can cause photosensitive reactions, including seizures (Canvas.com, 2016). Flashing content is ideally avoided entirely or only used in a way that does not cause known risks. Meeting this requirement helps separate foreground from background, to make important information more distinguishable. This includes considerations for people who do not use assistive technologies and for people using assistive technologies who may observe interference from prominent audio or visual content in the background. For instance, many people with color blindness do not use any particular tools and rely on a proper design that provides sufficient colour contrast between text and its surrounding background (Web Accessibility Initiative, 2016) . For others, audio that is automatically played could interfere with text-to-speech or with assistive listening devices (ALDs). The visually impaired user will be able to hear the description if a reader is used. Those who cannot hear will read the script. The reader will play the audio of the script for those who are visually impaired. Coombs, N. (2010). 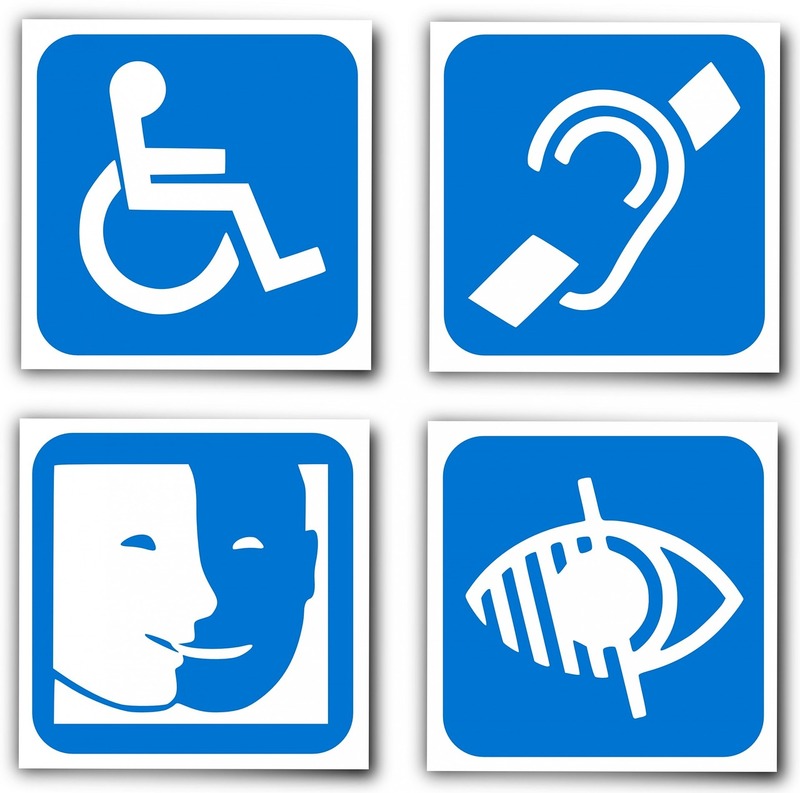 Making online teaching accessible: Inclusive course design for students with disabilities. Jossey-Bass. San Francisco: CA. Retrieved from googlebooks.com. The ODL is happy to announce its online training courses in Moodle. Interested members of the University of Technology, Jamaica can register here to complete the courses.